There's nothing like a 50-show tour to put a new band through its paces. Viet Cong has rattled and clanged through half of the tour supporting Victoria's Freak Heat Waves, taking them through the United States and across Canada and back. It’s a daunting proposition for a band less than a year old, but Viet Cong isn’t exactly made up of a bunch of fresh-faced kids. The band has the rhythm section of Women, the now-defunct post-punk prodigies that were were one of the best bands to come out of Calgary. “The idea is to jump into it. It's hard to feel like you're doing anything when you're stuck in Calgary playing the same venue over and over again. 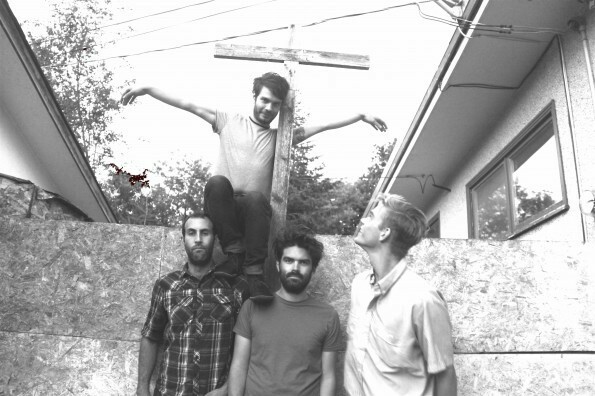 We needed to get out of there,” said Viet Cong singer and bassist Matt Flegel. Flegel and drummer Mike Wallace are joined by guitarists Scott Munroe, who Flegel had played with in the Chad VanGaalen band, and Daniel Christiansen, previously from a Black Sabbath cover band. After extensive touring the strain started to show in Flegel and Wallace’s old band—a brawl at a Victoria show in October 2010 marked their last onstage appearance. Guitarist Christopher Reimer passed away in his sleep 16 months later. In Viet Cong, Flegel and Munroe take main songwriting duties, their sound ranging from fuzz-laden drone to straight pop. Their self-titled cassette surfaced online a few weeks ago as a collection of mismatched home recordings, leaving impressions of the punk and shoegaze their old projects are known for. For Flegel those songs are just the orphans of the Viet Cong sessions, and the band is currently sitting on a cohesive debut record—they just need to decide who they’re going to put out the album with. The new material also adds more synths and drum machines beats into the mix. “We’ve been bringing that into the fold as the tour goes along,” said Flegel. “This is very much testing the waters. Even with the new sounds, however, Flegel believes his generation’s time has passed. According to him, all the best music in Calgary is coming from the 20-year-olds. But for those who do stay, bands like Women, and now Viet Cong, show that it’s possible to make it as a band in Cowtown. “The young dudes probably look up to us, but they don’t know how much we respect them already,” said Flegel. Originally published by The Link newspaper.